Birmingham Minimally Invasive Surgery aims to educate patients on the new procedures and technologies to help with weight loss. Our qualified surgeon and staff want our patients to be informed to ensure you are comfortable and confident with our services. The Orbera® gastric balloon also known as Apollo Orbera Surgery, is an innovative way in aiding weight loss. This gastric balloon is temporary, which makes it more appealing and less invasive. This is a non-surgical procedure, which only takes 20-30 minutes to complete. The cost is typically less expensive than more complicated surgeries such as a gastric bypass procedure. We provide support groups and seminars to educate you on the process and the aftercare. It’s a unique device because it’s temporary and will be removed. This is more of a weight loss tool rather than a “quick fix” surgery. You feel fuller from eating less, and your body begins to get used to ingesting smaller amounts. Gastric balloons have been used for weight loss for over 20 years and are considered a safe weight loss alternative for those looking to get healthier. ORBERA® will help you shed the pounds you need to become more active. This will make physical activity easier as well. 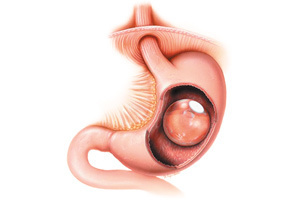 After being provided with a mild sedative, the balloon is placed into the stomach and filled with saline until it reaches the size of a grapefruit. This temporary balloon will make you feel fuller and control portion sizes. Patients typically lose the most weight in the initial months. The Orbera® stays in place for six months to ensure you learn to control your portion sizes. Many people have lost up to three times the weight of traditional diets. However, it’s important to maintain the suggested diet and exercise plan to live a healthier life. The ORBERA® Coach platform is an on-demand telehealth program that provides virtual aftercare support tailored to meet the needs of your patients who undergo the ORBERA® Gastric Balloon procedure.